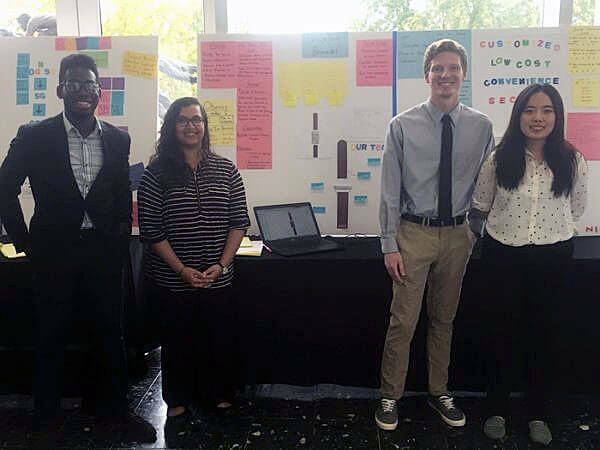 A team of NIU students put their classroom knowledge to the test during the inaugural AMITA Health Design Challenge held last month at Arlington International Racecourse. The two-day design challenge was aimed at generating ideas to improve the health of our nation’s aging population. The NIU team of Oluseun Taiwo, Jarin Tasnim, Michael Potoniec and Mi Chen was one of a dozen representing area colleges and universities. The students arrived Saturday morning and took part in a series of activities that included workshops and mentoring sessions aimed at generating ideas to improve seniors’ health. Kersh said the more students can engage in experiences like this, the better prepared they will be to be leaders and scholars in their field. And while the NIU team did not advance to the finals, they won in other ways.